The Washington State Department of Transportation identified more efficient and cost effective ways to collect data from rural areas of the state in order to develop a new communications system. This involved evaluating successes and failures of previous projects, and determining the data type, capacity needs, and data speeds needed in rural areas. To be efficient, the new system needed to leverage existing resources used by WSDOT’s voice system. 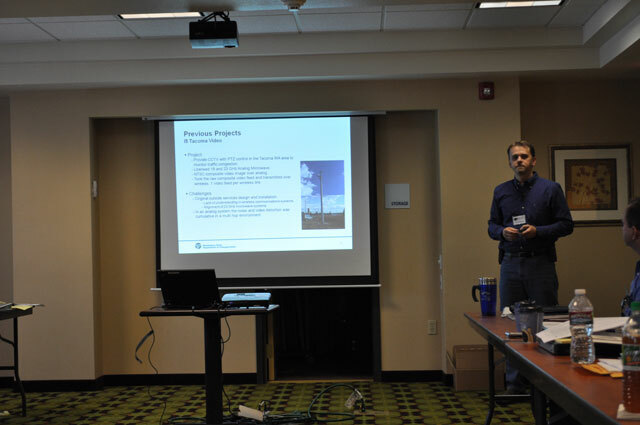 Mr. McDowell gave a detailed review of WSDOT’s wireless data communication systems for rural ITS, including lessons learned from previous projects, and engineering, tools, and technology used to implement the current system. Currently, WSDOT uses high speed (above 500 Kbps) and medium speed wireless communications to control over 125 rural ITS devices statewide. Tim McDowell listens to a question from Forum participants. The Nevada DOT has deployed ITS devices at several remote locations throughout the state where municipal power sources are either unavailable or cost prohibitive. Photovoltaic technology has successfully provided a reliable and cost effective method of generating electrical power for rural RWIS, CCTV, flashing beacons, and flow detection installations. 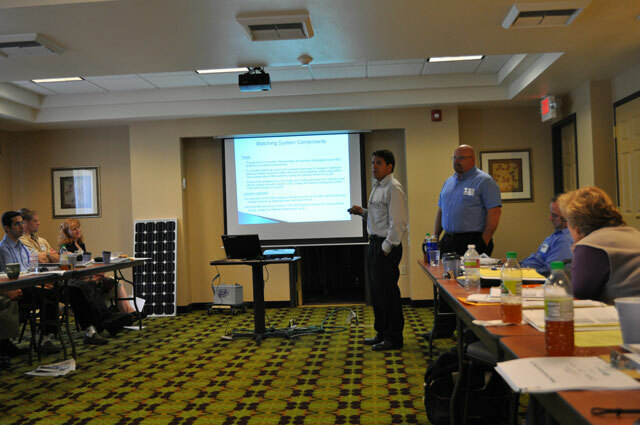 Mr. Aragon and Mr. Dickinson discussed how Nevada DOT has implemented solar systems to power rural ITS elements, including design methods and calculations, system lifecycle costs, and lessons learned. The duo set-up a basic mock-up of a complete photovoltaic power system typical of those used in rural ITS applications. Mark Aragon and Jon Dickinson respond to a question during their presentation. Caltrans maintenance crews rely on a two way radio system to communicate with each other and with their dispatch during normal operations as well as emergencies. Currently, maintenance crews in rural areas use an antiquated system that is inadequate for today’s operational requirements. Caltrans has previously deployed 800 MHz two-way radio in urban areas, but because of the line of site requirement for signal propagation, the system was difficult to successfully deploy in rural and rugged terrain. To address this, Caltrans has designed, developed, and implemented a voting scan 800 MHz radio communications system that provides simplified operation and improved mobile radio coverage for maintenance crews. 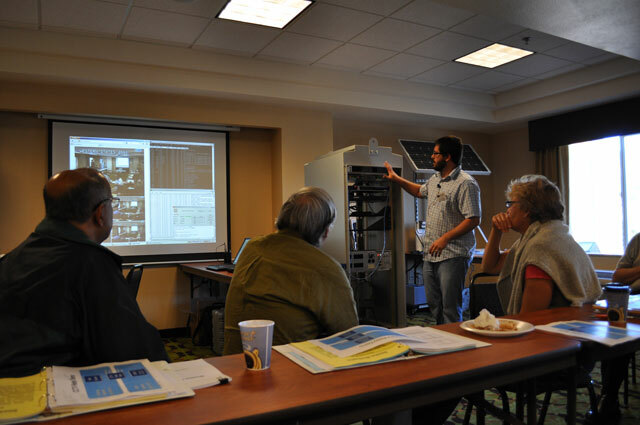 The Caltrans Headquarters team explained how the voting scan 800 MHz system works, why it was chosen for use in rural areas, and the design and challenges of current deployments of the system in northern California. 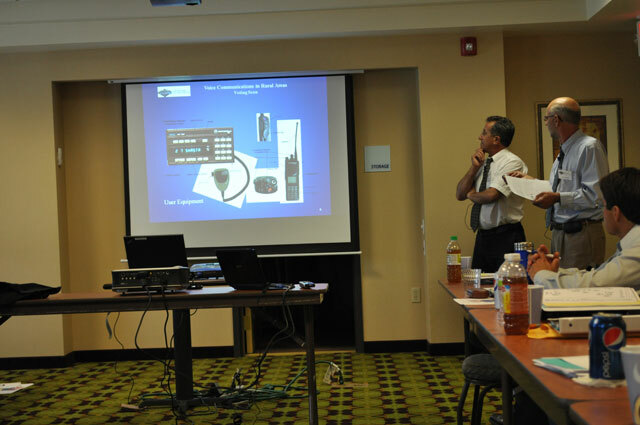 Javier del Rio and John Schmidt provide an overview of radio communication equipment. Caltrans has teamed with the AHMCT Research Center at UC Davis to adopt and enhance the open source Intelligent Roadway Information System (IRIS), an Advanced Traffic Management system. The IRIS system is a software tool that can provide TMC operators and traffic managers with a real-time view of highway conditions. The team explained the history behind Caltrans’ adoption of IRIS and development done to enhance the system. 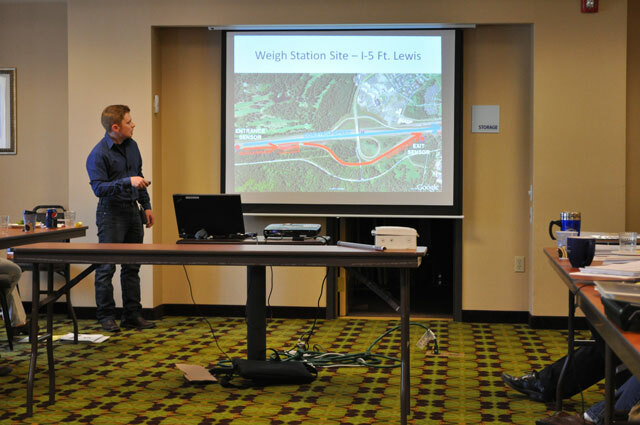 The detailed presentation discussed development, functionality, configuration, testing, maintenance, associated costs, and scalability of the Caltrans IRIS system. 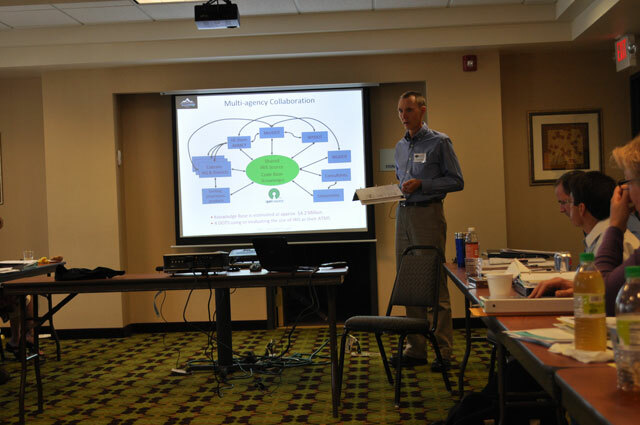 Michael Darter describes multi-agency collaboration on the IRIS project. ITS Standards development has changed over the past few years requiring a need to update and improve previous ITS Standards training courses. Newly developed ITS Standards allow deployers to better ensure that they will implement a system that is compatible, interoperable, interchangeable, and conformant to ITS Standards. The ITS Standards Program and ITS Professional Capacity Building Program are undertaking a project to develop a new set of training materials to assist agencies in meeting project needs emphasizing the acquisition, implementation, and testing of ITS Standards. 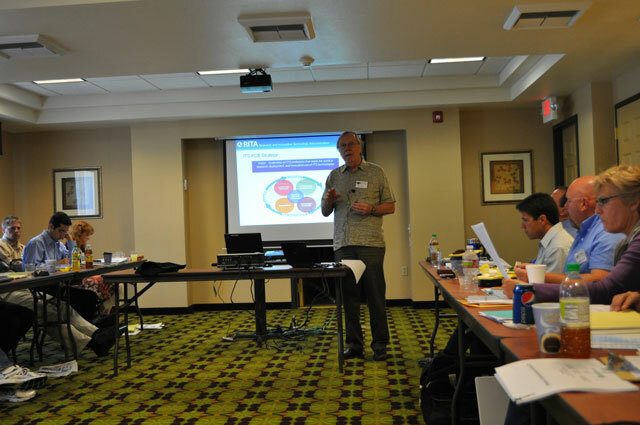 Mr. Lister gave a brief overview describing the project, initial development, and benefits of a re-designed ITS Standards training program. Mac Lister discusses ITS standards. A key requirement of rural ITS deployments is to make roadway condition information, such as CCTV images, RWIS data and DMS messages, available to the public via the web for effective pre-trip planning. This usually requires two types of communication networks, a field element network and an administrative network. Often there is a need for a device that virtually “glues” a field network together with an administrative network. Engineers in Caltrans District 2 have developed an Information Relay to act as a “glue” device. 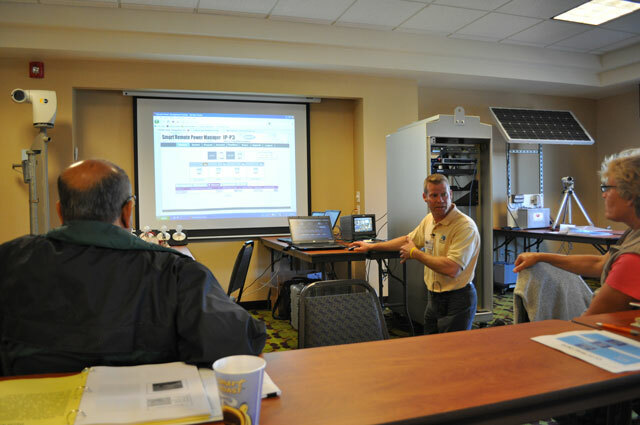 Mr. Koeppen reviewed and demonstrated a system and single processor that has been designed and configured to both pull data from the field/local devices as well as push information to external sources, simplifying information exchange and eliminating unneeded devices and processes. Keith Koeppen demonstrates software that both retrieves data from field elements and then pushes the information to external sources. In the past, when a field element was no longer communicating with the TMC, the device would first be verified as unreachable and then a technician would be sent to the field to investigate. To potentially avoid the remote callout, a remote power controller could interrogate and reset the field element device. Dean Campbell and Sean Campbell explained and demonstrated a remote power controller with telephone and internet control functions that can reduce or eliminate the need for personnel callouts to rural ITS field elements. Dean Campbell demonstrates software for remote power control. There are several factors that may affect the quantity and the quality of the travel time data collected with a Bluetooth-based system reading Media Access Control (MAC) addresses. A critical hardware factor is antenna type. Dr. David Kim and graduate student Amirali Saeedi explained the project objectives, testing procedures, and data analysis for a study comparing the effect of the characteristics of various antennas on travel time data collection using Bluetooth-based technology. Results and continuing research were shared and discussed. 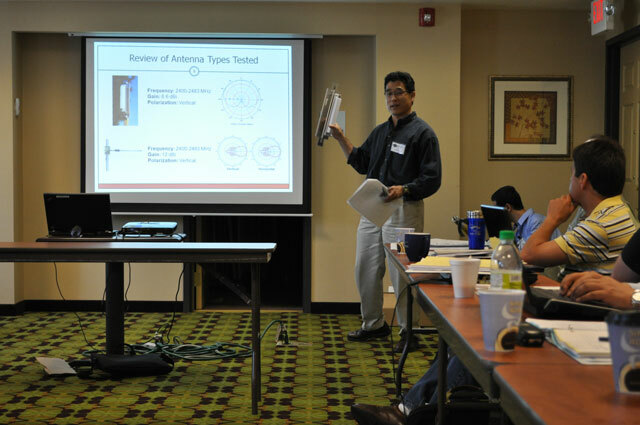 David Kim shows one of the antennas tested in the OSU study. MAC Address-based Delay Measurements at Rural "Gateways"
The lack of extensive sensor, communication and power networks makes traffic data collection in rural areas a challenge. However, recent advances in Media Access Control (MAC) address based travel time collection technologies have allowed for travel time data to be collected in remote locations without significant investment. Rural “gateways” such as border crossings, passes, and weigh stations, and associated travel delay are of particular interest to the trucking industry as well as the general public. Graduate student Yegor Malinovskiy and Dr. Yinhai Wang presented their research project that is examining the use of Bluetooth technology to measure delays at rural “Gateways.” The basics of Bluetooth technology and its accuracy were discussed along with up and coming technologies, truck performance measurements, and the results of the field experiments conducted to date. Yegor Malinovskiy shows a map of the site where one of his project team's experiments took place.